Stoma Caps SALE Mini Ostomy Bag, Hollister Stoma Caps, 1 Piece Stoma Cap. What Is a Stoma Cap? How Is a Stoma Cap Designed? Stoma Caps are small "mini" ostomy pouches intended to be worn for short periods of time. A stoma cap is worn when wearing a larger pouch is unnecessary, intrusive or a nuisance. Many people choose to wear a stoma cap during activities such as swimming, playing sports, working out or during intimate moments. Ostomy patients who are also skilled with irrigating their colostomy and who are familiar with their bowel routine may also choose to wear stoma caps. 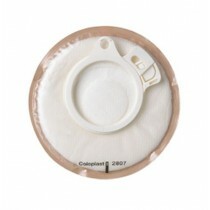 Most stoma caps are small, circular and have a tiny hydrocolloid flange that can be cut-to-size by the user. However, some manufacturers offer stoma caps in one or two pre-cut sizes, as well. 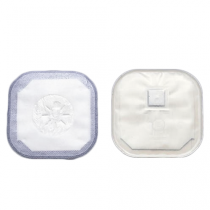 The size of the stoma pouch will be roughly equal to the size of your palm and will contain a convenient filter to allow gas to escape quickly and without any unwanted odors. Many stoma caps are also designed with a small piece of absorbent padding or an inner interior sheet. Stoma caps with a filter are an effective solution if you're searching for a way to filter out unwanted odors and reduce gas build up. 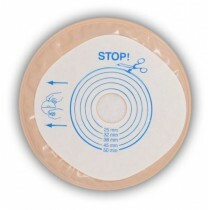 Stoma caps designed with cloth tape are a lightweight and comfortable solution for sensitive or easily-irritated skin. 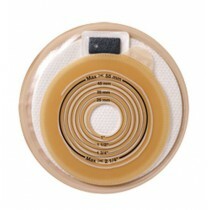 Stoma caps with a CenterPointLock feature provides an audible "click" and confirmation that your ostomy bag is securely attached. 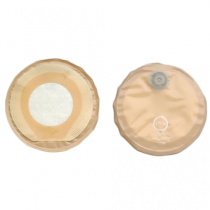 A contoured stoma cap might be ideal for you if you have an irregular-shaped stoma and need to apply additional pressure to the area around the stoma. 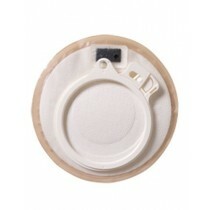 The Hollister Stoma Cap is one of our most popular options due to its square shape and soft, plastic cover. 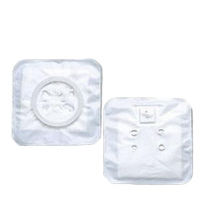 This Hollister Stoma Cap does not contain a hydrocolloid flange on its back; on the contrary, the rear side of the cap contains a sticky substance that allows you to easily and conveniently place the entire cap directly onto the skin.